Heat oven to 350°F. Line 15x10x1-inch pan with foil. Spray foil with cooking spray. Place crackers in single layer in pan. In 2-quart saucepan, cook and stir butter, sugar and salt over medium heat until butter is melted. Heat to boiling, stirring frequently. Boil 7 to 9 minutes longer, stirring frequently, until light brown color. Remove from heat. Add vanilla; stir until blended. Immediately pour mixture evenly over crackers in pan; spread to cover. Bake 13 to 15 minutes or until bubbly and brown in color. Sprinkle chocolate chips on top of cracker mixture. Let stand 5 minutes. Spread chocolate evenly over cracker mixture. Sprinkle with candy sprinkles. Cool completely, about 2 hours or until chocolate is set. Break into pieces. Store covered in refrigerator up to 1 week. Try semisweet or dark chocolate chips for a new flavor twist! To line pan with foil, turn pan upside down. Tear off a piece of foil longer than pan. Smooth foil around pan bottom, then remove. Turn pan over, and gently fit shaped foil into pan. 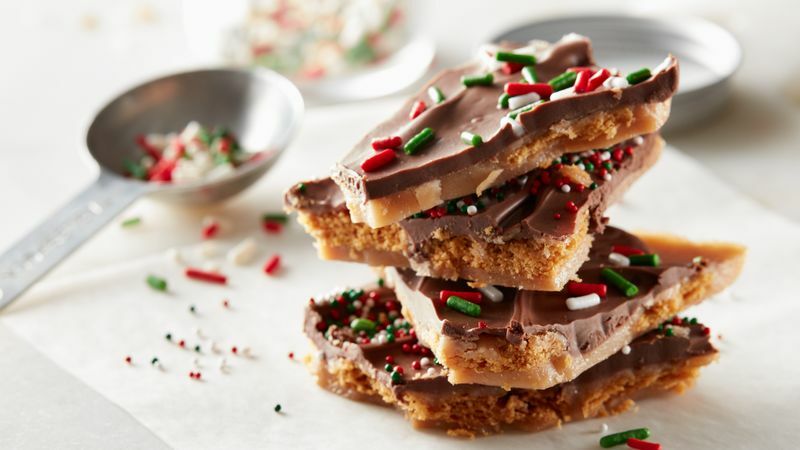 When toffee is cooled completely, lift out of pan by foil “handles,” peel back foil and break apart toffee. For success when making toffee, pay attention to cooking time and toffee color for the perfect recipe.